Join artists, curators, and scholars for presentations and conversations on the legacy of artist Ree Morton (b. Ossining, New York 1936; d. 1977), who will have her first major exhibition in the United States in nearly forty years at the Institute of Contemporary Art in fall of 2018. Morton’s short, but prolific career was profoundly shaped by her time in Philadelphia, where she attended graduate school and taught for several years. Her installations, sculptures, drawings, and paintings span a single decade of artistic production before her untimely death in 1977. Though the eclectic arc of Morton’s practice was rooted in post-Minimalism, a poetic approach to language and symbolism progressively distanced her work from easy categorization in the early to mid-70s. Her inclusion of narrative—through literary, philosophical, and autobiographical references—and use of bold color and theatrical imagery infused these objects and installations with sly humor and a prescient concern with the decorative, generating a feminist legacy increasingly appreciated in retrospect. Morton’s conceptually rigorous work can seem esoteric at times, yet her intention is ultimately one of generosity towards the viewer, and it is this spirit of generosity, playfulness, and joy that this symposium—and subsequent exhibition—hopes to expand. Participants include Becca Albee, Ian Berry, Nayland Blake, Cynthia Carlson, Roksana Filipowska, Sabine Folie, Kathryn Gile, Anissa Mack, Sid Sachs, Allan Schwartzman, and Abi Shapiro. Organized by Kate Kraczon, Laporte Associate Curator and Lauren Downing, Curatorial Assistant with Tausif Noor, Spiegel-Wilks Curatorial Fellow. Registration is appreciated, but not required. Register here. Becca Albee is an artist based in Brooklyn, NY. Her work has recently been included in solo exhibitions at SITUATIONS, New York; Et al., San Francisco; and 356 S. Mission Rd, Los Angeles; and has been exhibited in group exhibitions including Portland Museum of Art, Portland, ME; Art in General, Brooklyn; CUE Foundation, New York; Irish Museum of Modern Art, Dublin; CAM, Raleigh; Halsey McKay, East Hampton, and The Bronx Museum of the Arts, Bronx. Albee has received fellowships and residencies awarded by The MacDowell Colony, Yaddo, Irish Museum of Modern Art, Fundación Botín, Artlink Ireland, Blue Mountain Center, Lower Manhattan Cultural Council, and Skowhegan School of Painting and Sculpture. Albee’s papers are in the Riot Grrrl collection at New York University’s Fales Library & Special Collections. Albee is currently an Associate Professor at The City College of New York, CUNY. Ian Berry is Dayton Director of The Frances Young Tang Teaching Museum and Art Gallery and Professor of Liberal Arts at Skidmore College. He has organized over 100 museum exhibitions for the Tang and for museums across the United States. Current projects include the solo exhibition: Njideka Akunyili Crosby: Predecessors; a two-year performance-based residency/installation with Kamau Amu Patton, and the career-survey Dona Nelson: Stand Alone Paintings. During his tenure, the Tang’s encyclopedic collection has expanded greatly through key acquisitions and gifts with recent significant additions to historical photography and contemporary art holdings. Berry is a leader in the field of college and university museums, and is a regular speaker on interdisciplinary and inventive curatorial practice and teaching in museums, and he is well known for his active publication record including monographs on artists Terry Adkins, Nancy Grossman, Corita Kent, Nicholas Krushenick, Tim Rollins and K.O.S., Alma Thomas, and Fred Tomaselli. He has chaired the Visual Arts Panel of the New York State Council on the Arts and serves on several advisory committees including Cranbrook Academy National Advisory Committee, Artist Advisory Board of the Fabric Workshop and Museum, and Saratoga Springs Arts Commission among other regional and national arts organizations. Nayland Blake is an artist, writer, educator, and curator from New York City. They attended Bard College and then California Institute of the Arts, receiving their MFA 1984. They have had one-person exhibitions at the San Francisco Museum of Modern Art; University Art Museum, Berkeley; Contemporary Arts Museum, Houston, and the Tang Teaching Museum at Skidmore College and their works are in the permanent collections of The Museum of Modern Art, The Whitney Museum, Los Angeles Museum of Contemporary Art, the Brooklyn Museum, The Studio Museum in Harlem, and many others. They have authored numerous catalogue essays, as well as articles and interviews appearing in such publications as Artforum, Out, Interview, and Outlook. In 1995 they were co-curator, with Lawrence Rinder, of the landmark exhibition In A Different Light, at the University Art Museum, Berkeley, the first museum exhibition to examine the impact of Lesbian, Gay, Bisexual and Queer artists on contemporary art. Since 2002 they have served as the founding chair of the ICP/Bard MFA program at the International Center for Photography in New York. Blake is represented by Anglim Gilbert Gallery in San Francisco, and Matthew Marks Gallery in New York. Cynthia Carlson is an artist based in New York. Carlson has had nine solo museum exhibitions and forty-seven one woman exhibits, including galleries in Chicago, Philadelphia, and New York. She has had several public art commissions, and numerous group exhibitions in museums and galleries throughout the US, Canada, and Europe. In 1977, she was invited to participate in a sculpture exhibition at Artpark, in Lewiston NY, where she built and decorated a life sized gingerbread house, 13-feet high. She taught for 40 years, first at the University of the Arts in Philadelphia, and later at Queens College, CUNY, where she is Professor Emeritus. She also served for more than twenty years on the Artist Advisory Committee of the Marie Walsh Sharpe Art Foundation. 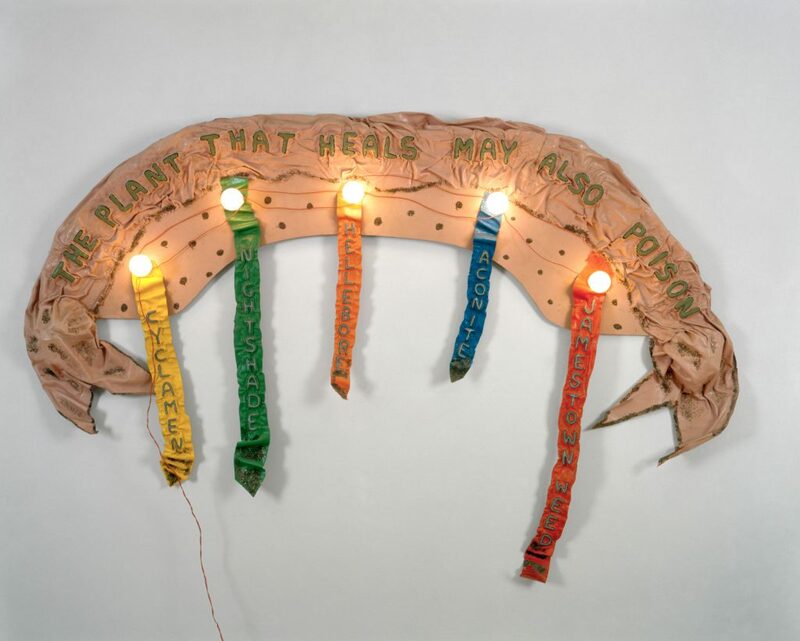 In the early 70s, for several years, she traveled throughout the United States documenting Environmental Folk Art and lectured extensively on the material. In 2012, she donated the entire collection of visuals and documents to the L’Art Brut Museum in Lausanne, Switzerland. Lauren Downing is the Curatorial Assistant at ICA, where she has worked since 2014. She is also a co-owner of Ulises, a local bookshop and curatorial platform focused on artists’ books and independent art publications. While attending The Pennsylvania State University, she triple-majored in Art History, Finance, and French, with a minor in International Business, and is now earning her M.A. in the History of Art at The University of Pennsylvania. Before moving to Philadelphia, she was the Assistant Director of Ion, a contemporary art and design gallery. Roksana Filipowska is a PhD candidate in History of Art at the University of Pennsylvania, where she is writing “Take Great Care: Plastics and Plasticity in Art and Conservation since the 1960s,” a dissertation examining how synthetics and their afterlives have introduced unprecedented issues surrounding material duration and shared accountability towards the environment. Her publications include “Richard Hamilton’s Plastic Problem” in Distillations Magazine, “On Plasticity and Plate Tectonics: An essay on Digital ≈ Soft” for Grizzly Grizzly, and “In Defiance of Propaganda: Photographic Failure as Shared Ground” in Too Good to be Photographed (Lugemik, 2017). This year, she is the Sachs Programming Fellow in Contemporary Art and a lecturer at the Barnes Foundation. Sabine Folie (born 1962 in Bolzano, Italy) is an art historian and curator, living in Vienna. She is director of the VALIE EXPORT Center Linz. Research Center for Media- and Performance Art and Guest Professor for Cultural History of Modernism at the Bauhaus-University Weimar. From 2008 until 2014 she was director of the Generali Foundation, Vienna and from 1998 until 2008 Chief Curator of Kunsthalle Wien. She has been curating more than 60 monographic exhibitions and thematic exhibitions, a.o. about Marcel Broodthaers, Eva Hesse, Dorothy Iannone/Lee Lozano, Ree Morton, Ana Torfs, Danica Dakić , Morgan Fisher, Ulrike Grossarth, Willem Oorebeek and about topics such as Un Coup de Dés. Writing Turned Image. An Alphabet of Pensive Languae; Modernity as a Ruin. An Archaeology of the Present; unExhibit. In preparation: VALIE EXPORT. The Archive as a Site of Artistic Research (n.b.k. Berlin, before LENTOS, Linz) and a retrospective on Ernst Caramelle at mumok, Vienna. Kathryn Gile has worked at Alexander and Bonin, New York since 2009 and has been the Director since 2014. During this time, she has worked closely with Matthew Benedict, Mona Hatoum, Emily Jacir, Rita McBride, and Sylvia Plimack Mangold, planning for gallery and museum exhibitions. She has also done extensive work with the estates of Ree Morton and Paul Thek for various exhibitions and has organized and created inventories of their archives. She received a B.A. in Art History from Bard College. Kate Kraczon is the Laporte Associate Curator at the Institute of Contemporary Art, University of Pennsylvania, where she has organized over twenty exhibitions since joining the museum in 2008 from the Museum of Contemporary Art, Chicago. She is currently working on Ree Morton’s first major retrospective in the United States in over three decades (2018), and is collaborating with ICA curator Alex Klein on an exhibition of work by Suki Seokyeong Kang (2018). Kraczon has curated solo exhibitions by artists including Basel Abbas and Ruanne Abou-Rahme, Karla Black, Alex Da Corte and Jayson Musson, Angel Nevarez and Valerie Tevere, and Becky Suss. She holds degrees from Oberlin College and the University of Pennsylvania. Anissa Mack is an artist living in Brooklyn, NY. She received her MFA in Sculpture from Tyler School of Art, and her BA from Wesleyan University in CT. Previous solo exhibitions include Laurel Gitlen, New York; Josh Lilley Gallery, London; Santa Barbara Contemporary Art Museum; and The Contemporary in Atlanta, GA. Her work has been included in group exhibitions at Brennan & Griffin, 67 Ludlow, Fleisher/Ollman and the Seattle Art Museum; among many others. She has also created commissioned public projects for the Public Art Fund, WaveHill, the Queens Museum, and Socrates Sculpture Park. Her current solo exhibition, Junk Kaleidoscope is on view at The Aldrich Contemporary Art Museum until April 22, 2018. Tausif Noor is the Spiegel-Wilks Curatorial Fellow at ICA. He is a graduate of Dartmouth College, where he studied art history, and Goldsmiths, University of London, where he received his MA in Art and Politics. From 2014-15, he was a Fulbright Scholar in India, where he worked with organizations such as the Foundation for Indian Contemporary Art and assisted at the 2014 Kochi-Muziris Biennale. Noor previously held internships at the Whitney Museum of American Art, the Imperial War Museum in London, and the UK-based not-for-profit agency Culture+Conflict. He is a contributing editor at Momus, and his writing has appeared in ArtAsiaPacific, Frieze, and Artforum.com among other publications. Sid Sachs has been the Director of Exhibitions at the University of the Arts, Philadelphia since 1998. Starting in 1972, he worked in commercial galleries in New York and Philadelphia (two in the American Art Dealers Association). He has assembled exhibitions since 1979 including Herbert Waide Hemphill Collection of American Folk Art (1988), Conspicuous Display (1989), and Pop Abstraction (1998). Yvonne Rainer; Radical Juxtapositions 1961 – 2002 was awarded the best monographic exhibition from the New England branch of AICA in 2003 and Seductive Subversion; Women Pop Artists 1958-1968 won the national AICA award for the Best Thematic Museum exhibition of 2010. One-person exhibits have included Morton Bartlett, Robert Crumb, Rosalyn Drexler, John Duff, Ron Gorchov, Ree Morton, Matt Mullican, Thomas Nozkowski, Jack Pierson, Lucas Samaras, Italo Scanga, John Stezaker, Robert Watts and Lebbeus Woods. Sachs teaches art history and has written for Art in America, Arts, American Ceramics, Burlington Magazine, Metalsmith, The New Art Examiner, and numerous catalog essays. He recently has been appointed on the Steering Committee of the Philadelphia Avant-Garde Studies Consortium at the University of Pennsylvania. Dr. Abi Shapiro is an art historian based in England with a research specialism in histories of post war installation art made by women. She holds a PhD from McGill University in Montreal where her thesis “Ree Morton and Feminist Installation Art: 1968 – 1977” took Morton’s career as a case study to explore the absence of women in early installation art histories and consider the artist’s legacy in relation to 1970s feminist art. She also examined Morton’s extensive notebook archives to analyze the broader critical implications of using women artists’ autobiographical writing in art history. She has presented her research on Morton at international conferences including The Feminist Art History Conference at American University in Washington D.C., University College London, and at The Association of Art Historians at the University of East Anglia, and she occasionally writes for Hyperallergic. She is currently writing a publication about women artists’ notebooks and working on a monograph of Ree Morton. ICA was recognized as part of the inaugural Sotheby’s Prize with a commendation that applauds the breadth and depth of ambitious exhibition research for Ree Morton: The Plant That Heals May Also Poison. Support for Ree Morton: The Plant That Heals May Also Poison has been provided by The Inchworm Fund. The Inchworm Fund is an endowment created to respond to ICA’s spirit of exploration, supporting artists and curators in their quest to uncover the unknown through multiyear research, exhibition, publication, and conversation. In naming the fund, visionary Philadelphia patron Daniel W. Dietrich, II wished to attract fellow contributors, encouraging ICA to reach and expand toward new possibilities – like an adventurous inchworm.